It’s not easy being green -- in Arizona. Weed advocates walk a very thin line. A citizen’s referendum legalizing and decriminalizing adult-use marijuana failed in 2016, possible because of the massive financial contribution by a pharmaceutical company with a special interest and/or the presidential election. As a result, Arizona marijuana advocates inside and outside the legislature worry about making waves that would rock the boat of their passionate commitment to liberalizing the law. Advocates for marijuana liberalization were outspent in the 2016 referendum by the opposition, thanks in large part to a $500,000 contribution by a manufacturer of opioids based in Chandler, Arizona. Those special interests will not go away. Arizona voted for President Trump. While there are conservative areas of retirees in the state, a county-by-county count showed weed favoritism lies around the major population areas. These areas host senior retirement communities, but many seniors voted for Trump and in favor of the marijuana change. This suggests that if the vote on marijuana was not coinciding with the presidential election, it would have benefited from the separation. President Trump campaigned on promises to prosecute drug criminals -- including those with marijuana-related charges. It’s not clear if he had a short or long-term policy in mind. But, he did appoint Senator Jeff Sessions as Attorney General. Support appointment of Federal judges with the same mindset. Hold federal' attorneys to enforce existing federal drug laws related to marijuana. Prosecute federal marijuana crimes in states that have legalized or decriminalized the growth, sales, purchase, and use of cannabis. Proponents of marijuana availability, accessibility and use find themselves in a bit of a bind. They want to take advantage of the successes involved in 2016, but they’re afraid to draw the ire of Washington. They find that Arizona has become a case test. It was approved by 53.2 percent of voters. The recent medical marijuana law amendment expands the list of eligible medical conditions. It further refines regulations on distribution and aligned administrative functions. But, it doesn’t have much effect on existing medical cannabis dispensaries that have flourished since the original grant in 2010. You cannot purchase medical cannabis in Arizona without a medical card from specifically authorized Arizona doctors. You also can’t purchase if you are not an Arizona resident and you cannot transport it out of state. If you have the credentials, you can shop at the more than 120 Arizona dispensaries where you’ll find Indica and Sativa flowers. Medical cannabis dispensaries may also sell concentrates, edibles, transdermal products, seeds and clones. Arizona law allows medical marijuana patients to buy 2.5 ounces every two weeks. Patients who live more than 25 miles from a dispensary may grow up to 12 plants. A registry identification card costs $150 although Supplemental Nutrition Assistance participants may pay $75. The charge for ID cards for designated caregivers is $200 per patient under care. Changes and replacement to cards runs $10. The ballot initiative comes from a group of activists in an effort will legalize cannabis and hemp growing, usage, and sales for adults 21 and up. 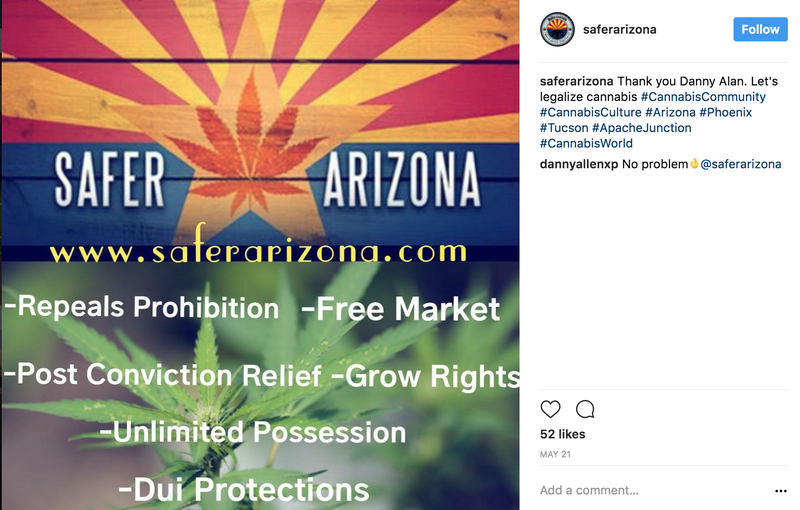 Safer Arizona proposes that same licensing and regulations for the companies the state requires of any other business in that industry. It does also require mandatory testing of the cannabis product and labeling to make sure people know it has cannabis in it. Beyond the cannabis testing, edible shops will be held to the same standards as any other food business. The initiative also has post-conviction expungement. "Arizona has had cannabis as a felony for quite awhile," explained Safer Arizona Secretary Zack Ocker. "We hope by doing this it will allow many people to get their civil rights back and make it easier to find work as well". Safer Arizona needs just over 150,000 signatures to make it to the November 2018 ballot, but the organization has set the goal of 300,000 to make up for any signatures the state decides aren't valid. So, if you’re an Arizonan, you must sign the petition, contact your legislators regularly and finance the campaign with your time, toil and talent.